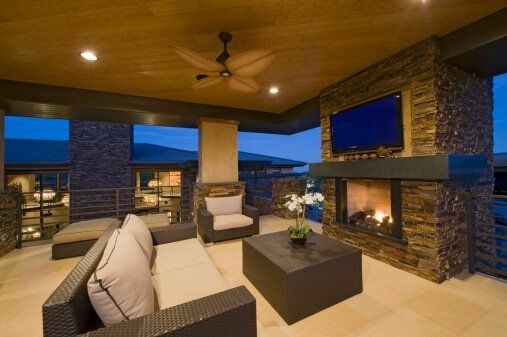 Outdoor living spaces are a popular choice for many homeowners. This is especially true in areas like here in Arizona, where the great climate allows for enjoying outdoor spaces for much of the year. Local residents are lucky in that they can appreciate and enjoy the opportunity to spend a lot of time relaxing and socializing outdoors nearly all year long. It would be a shame to let this enviable opportunity go to waste, so we are happy to see that so many property owners in the area have embraced the idea of expanding their home’s boundaries in the form of outdoor living space. For those who love the idea of outdoor living but are trying to figure out how best to use their outdoor space or how to incorporate this concept into their property (and their lifestyle), there is good news. As the popularity of outdoor living space has grown, so have the possibilities for what this space can look like and how it can be used. Some of the best examples of recent outdoor living projects have been those that put a completely unique spin on this idea, breaking the standard mold of what we think of when envisioning this type of space. Feel free to break the rules and get creative. The options are limited only by your property lines, budget and imagination. For those who want to start with a basic foundation of a common outdoor living theme, let’s review some of the most popular purposes for this type of space. Outdoor kitchens. Perhaps one of the most popular (and, in many cases, practical) uses of outdoor space, an outdoor kitchen offers an easy and efficient way to entertain outdoors. For those who like to cook and plan social gatherings around food, this is a convenient and enjoyable alternative to trekking back and forth to the indoor kitchen to bring food and supplies outside. To help make things easier, manufacturers are constantly introducing new tools, appliances and materials designed to make your outdoor kitchen both functional and unforgettable. Entertaining space. This is a broad approach that can take many forms. A big factor in planning this type of space is your lifestyle, hobbies and activities you enjoy sharing with friends and family. (This goes for planning indoor entertaining spaces, as well.) On the upside, this opens the door for a lot of creativity and individual style, and can also make sure your space is as unique as you are. Don’t feel obligated to conform to someone else’s idea of the perfect outdoor entertaining space. Do you like movies? Set up a space that revolves around an outdoor screen. If gaming is your thing, think about ways in which you can create the ultimate gaming space. Gardens and water features. This type of outdoor space has an added benefit, in that it can often provide extra relief or protection from the elements (mainly, the scorching heat that has a tendency to plague this area). This is especially true if the arrangement includes a pergola or other covered or shaded element. Water features can help cool things off while also providing a nice sense of relaxation and escape. These types of spaces offer a perfect way to bring your outdoor space to life, literally, as you can include fish and other living creatures, as well as an assortment of plants, flowers or vegetation. Patios. Granted, a patio may sounds fairly unexciting. And traditional, basic patios can indeed be relatively boring. But there are plenty of new and creative spins that can pull a patio out of the dull and uninspiring territory and make it something remarkable. Multi-leveled patios are in high demand, and can serve a practical purpose as they provide a way to designate separate areas for specific uses or activities. A fresh or creative choice of materials is another way to add some personality to your patio. Consider pavers or tiles, which can be arranged in a special design or mosaic pattern. Bars and barbecues. These types of spaces can often be a sort of blend of other concepts, such as an entertaining space and an outdoor kitchen. Again, your priorities for designing and planning your outdoor space should be rooted in your personality and lifestyle. If you are the type who tends to favor casual, low-effort gatherings as opposed to gourmet meals, a barbecue set-up may be more suited to you than a formal kitchen feel. It can also be helpful to consider your friends and family members and their tastes, as well, because you want this to be a place where they will feel comfortable, too. RW Remodeling has many years of experience in creating amazing Arizona outdoor living spaces and would love to create an impressive outdoor retreat for your family.